It’s been a busy week for Apple news, with rumors swirling of a big Beats acquisition and its long-time PR chief stepping down. Apple also confirmed it acquired power efficient LED company, LuxVue. Well, here’s a tidbit more Cupertino-related news (via Engadget): it’s just hired a senior engineer who worked on Nokia’s PureView smartphone camera technology. Ari Partinen, who is listed on LinkedIn as “Lumia Photography Lead at Nokia” — joining Nokia back in 2007, the year Steve Jobs unveiled the original iPhone — has decided not to stay on under Nokia devices’ new owner Microsoft’s lead — but is instead heading to Cupertino to join Apple next month. 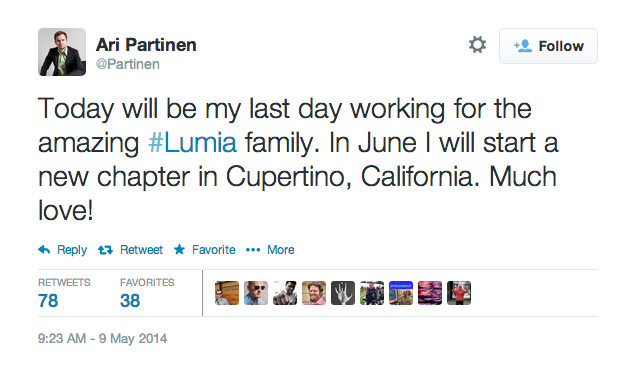 Partinen confirmed the company he’s moving to is Apple in another tweet. Working in the fields of mobile photography, image quality verification, verification up-streaming, 3rd party management and collaboration, supplier collaboration and technical marketing in various multimedia segments. His profile also details his current work as being “with image quality characterization and tuning on camera module level”. Previous to being Lumia lead, Partinen’s role at Nokia were also focused on image quality. Nokia’s PureView technology debuted in the Symbian-based 808 PureView in early 2012, a 41 megapixel camera which used a technique of pixel oversampling to reduce noise in cameraphone imagery — enabling lower resolution shots to be produced with high clarity and strong colour. The PureView brand and technology was subsequently inched into the Windows Phone Lumia range of smartphones — with a full 41 megapixel implementation finally arriving in mid 2013, with the Lumia 1020. Other PureView-branded high end phones in the range gained optical image stabilization tech, and improved low light capabilities. Apple’s iPhone cameras have long been lauded for being able to turn out high quality shots, but various patents indicate that Apple is continuing to think about how to push its camera tech forward — including smaller autofocus components to decrease the size of the camera module, triple sensors and lenses for improved resolution and colour accuracy, an optical image stabilization technique, and even a Lytro-style system for changing focus after a photo has been snapped. Other Apple camera-related patents have included hardware add-ons and swappable lenses for extending performance, and even a wireless camera remote control for previewing and reviewing photos with its own built-in display. Partinen is of course only one of the senior engineers working on Lumia imaging tech but it’s not a great sign for Microsoft that he’s jumping ship to Apple at this juncture. Nokia completed the sale of its devices and services business to Microsoft last month. Nokia previously lost its long-time head of imaging and photography, Damian Dinning, back in late 2012 — albeit that was couched as a personal decision on the UK-based Dinning’s part, as Nokia sought to relocate key strategic roles to Finland.